MC1: "Tonight we have some honored guests who can not be with us. 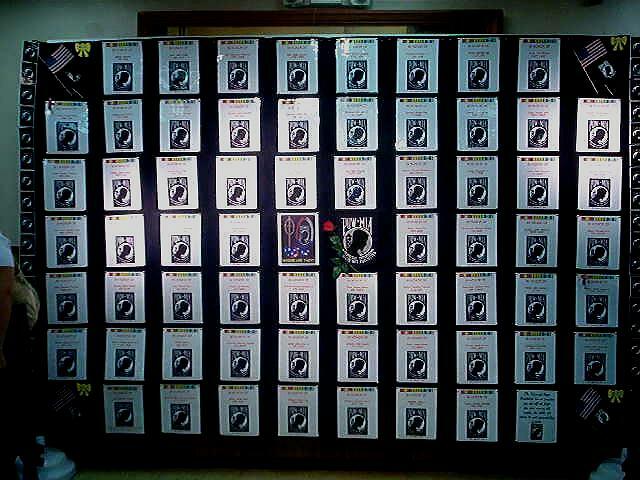 so we remember them in in this way." All rise. "Gentlemen, please uncover "
"Please direct your attention to the place setting in front of the podium, as a physical symbol of the thousands of American POW/MIAs still unaccounted for from all foreign conflicts. Accordingly at this time the Sgt-at-Arms will advance to light the candle "
MC1: "A reminder for us all to spare no effort to secure the release of any American prisoners from captivity, the repatriation of the remains of those who died bravely in defense of liberty, and a full accounting of those missing in action. 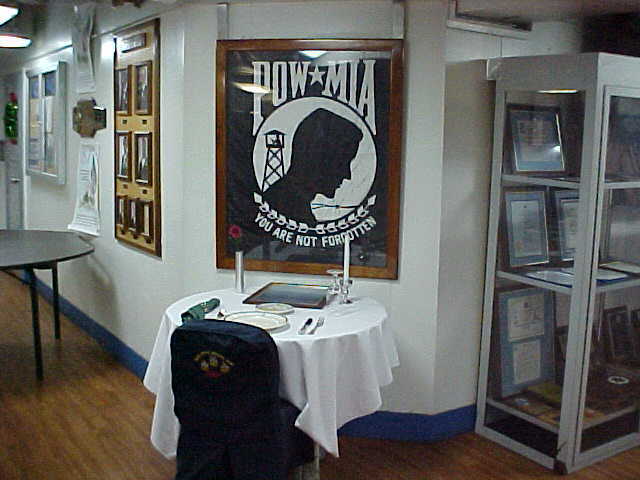 As the Sgt-at-Arms lights the candle I will explain the symbolism of the POW/MIA Place Setting." MC1: "The table is small, symbolizing the helplessness of one person. alone against his oppressors." MC1: "The table cloth is white for the purity of their intentions in responding to their Country's call to arms. MC1: "A slice of lemon is on the bread plate to reinind us of their bitter fate, and there is salt, symbolic of the tears shed by those who wait." MC1: "The single red rose in a vase reminds us of the families and loved ones who have kept faith, awaiting the return of our POW/MIAs"
MC1: "The yellow ribbon, tied so prominently around the vase, represents the yellow ribbon worn upon the lapels and breasts of thousands who bear witness to our Nations' unyielding determination to demand a proper accounting of our POW/MIAs." MC1: "The candle is the light of hope which lives in our hearts to illuminate their way home, out of the hands of their oppressors and into the arms of a grateful Nation." MC1: "The glass is inverted, for they can not toast with us tonight." MC1: "The chair is empty, for they are not here." MC1: "Remember, we all called them comrades, brothers, sisters and friends. Do not let them be forgotten, for surely they have not forgotten us. 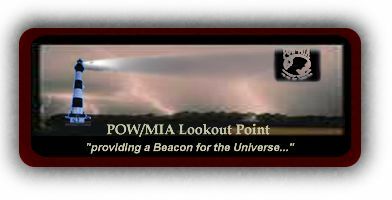 We will now pause for a moment of silence in honor of our Prisoners of War and Missing in Action." Father, as we go back to the routine of our lives; send forth Your Spirit with us to continually quicken our hearts, teaching us to remember as You remember; never forgetting Your own, and forever keeping watch over them. May the peace of Your Presence be a constant companion both for us here and those of our brothers and sisters in captivity; so that we all may walk with You toward our final home. Amen. The picture below is of a quilt that a very special lady made in honor of POW/MIA's from the state of Florida. There is a block for each & every one listed from Florida. This lady is a very special person who has done much work on behalf of the Veteran community. Thank you for giving me permission to share this beautiful work of art with others as they visit the website! God Bless You, Vikki! My thanks to Charles A Rogers for the great photo! Be it mental or physical. Henry Tavares is the husband of Brenda Morgan Tavares, whose uncle, Melvin Morgan, was promoted to Glory while a POW with the Tiger Survivors group in North Korea.